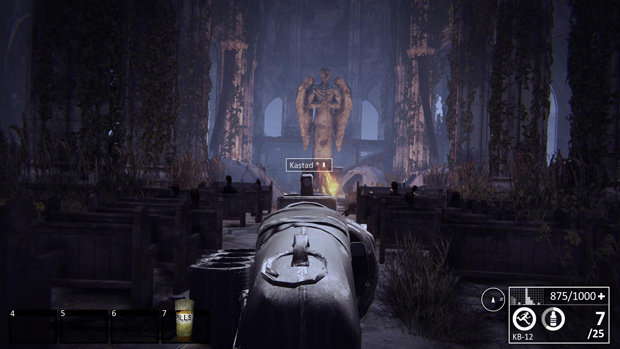 It is no real secret that survival sandbox games have been really popular lately, and have been bringing new forms of innovation to the normally stagnant shooting genre. There is a new kid in town, and its name is Nether. As a fanatic for anything in the survival sandbox genre, I couldn’t wait to get my hands on Nether to see what new innovations would burst from the shadows. Unfortunately things haven’t gone so smoothly over the last few weeks in the public beta phase. 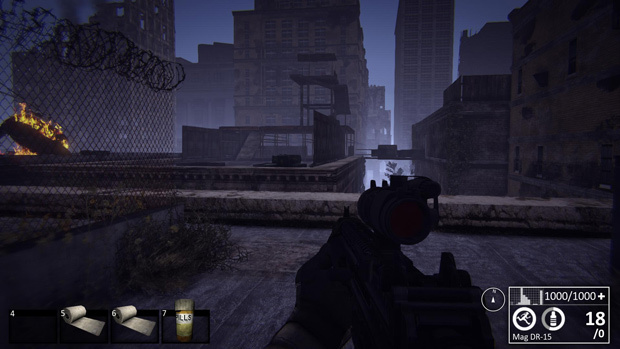 Nether is a first person urban survival game and, as said on their website, offers unique features to the genre. This is a bold statement coming from a game so heavily inspired by its successors, but let’s sum up these features real quick. Nether is about mutants. Some will see them as aliens, and some will see them as zombies, but the Nether are basically mutated humans that hunt you as their prey. These Nether are quite a bit more imposing than your average stumbling zombie hordes than what we have seen before, but unique? I would say no. The game itself currently does not offer any other unique features and thus we are off to a good start. Let’s talk some more about the Nether, because after all the whole game spins around them. There are a lot of different types of Nether, and each one of these species has its own abilities that will scare the hell out of you. Most of these Nether have teleporting capabilities; they will teleport around you in an attempt to surprise and scare you from every direction and angle. I had a few good encounters that made me jump out of my seat. Needless to say it’s rough outside of the safe regions when you don’t have an extra pair of eyes watching your back. If there are Nether in your area, you might want to turn around and find a different path, because these dangerous predators will come and say hello as soon as they see you. Just watch out as their hearing is far superior to their eyesight, and one wrong step can be enough to ring the dinner bell for the hordes. As such the primary goal of survival is simple enough. 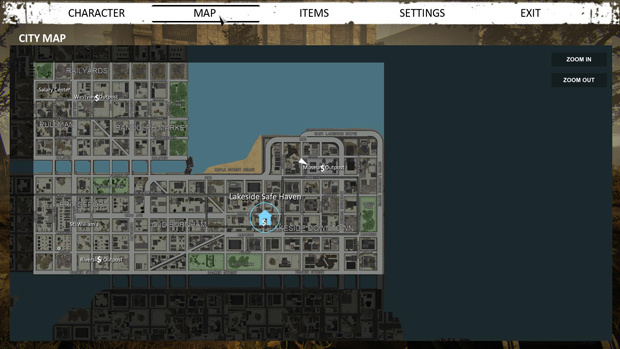 You’re among the last survivors in a Chicago-inspired city of ruin. 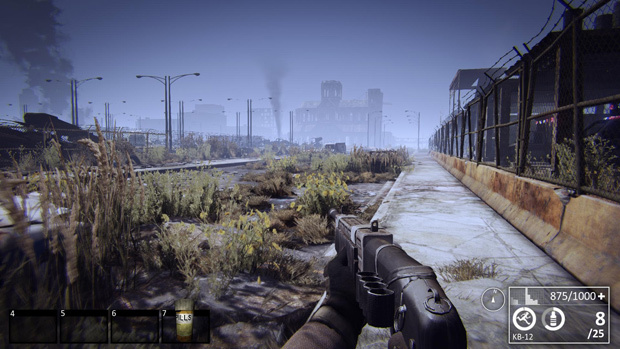 The setting has a feeling that the Nether are nothing new, as nature has already begun to reclaim major sections of town, causing the urban setting to resemble Will Smith’s I am Legend landscape. While surviving is always your primary goal, scavenging food and protection plays a close second in lasting from day to day. 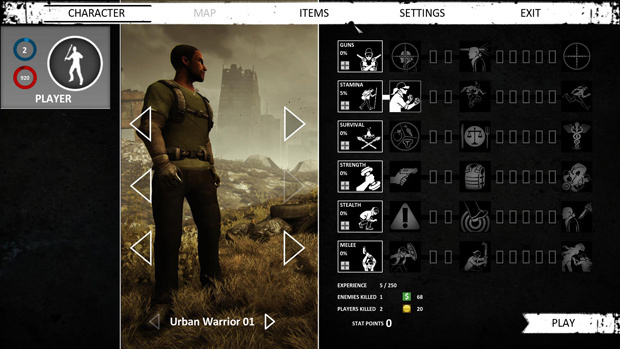 In the lower right corner is a concise piece of UI informing you of all you need to know: ammo, sprinting stamina, health, and hunger are all accounted for. Currently the water and food meter are combined as one, and this is something I would rather see separated as water should be a much scarcer and more valuable resource for gameplay reasons. From what I have seen in the limited area we beta tester get to play, the world itself is a major compliment of Nether. It’s massive and if the mini-map is to be believed, we haven’t seen anything yet. 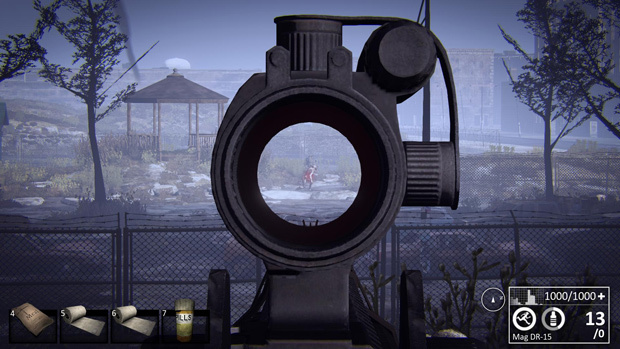 Unfortunately since this is a beta, we are only limited to a couple blocks, and we can only stare into the distance to the land that has not been opened yet. And this is where I honestly ran into my first problem with Nether. I believe Nether is one of those games that should’ve stayed in the alpha phase for a tad longer, and this can be seen in the actual game world itself. The vegetation isn’t really great looking, and the world itself can use some patching up. Some textures like smoke aren’t finished yet, and as a result the smoke will look fake as it sits stationary in mid-air. The inside of most buildings are completely empty, and there seems to be more junk than actual furniture or other props. It seems like the people took all their furniture while trying to flee the country. The world itself looks empty and full at the same time; you will see many blocks that simply look copy and pasted, which was not a great sign considering they had already limited our travel to so few blocks. Unfortunately your character’s movement animations were also a bit lacking. Various and commonly occurring bugs with movement can result in your character seeming like they are walking in a suit of iron, rockets and jetpack not included. Everything looks and works like it could use an update, and I honestly believe the launch itself was rushed for some odd reason. Unfortunately game studios tend to forget that the first glance of a product is more important than the actual outcome of the game, and I think most people that have either seen footage, or played it had honestly expected more of this game. It all feels a little wonky and clunky. Just like we have seen in other survival open world games, Nether’s community ended up breaking down into a big deathmatch with each man killing indiscriminately for sport. It’s a real shame because there are a couple features that encourage playing together with your friends and complete strangers. In Nether players will find outposts, or safe zones that can be attacked by waves of Nether. These places are not a safe haven at all, and you will definitely have to watch out when passing one or trying to enter one. The Nether are also a lot stronger than I had expected and can be an insurmountable threat when you find yourself exploring with no ammo left. Despite this there is some real dedication from Phosphor Games to include a variety of melee weapons that exist more as a method to keep the Nether at bay while your backup fires away safely behind you. Unfortunately when you are soloing nearly everything, these tools’ silent nature isn’t enough to balance how useless they are against one or two dangerous mutants. 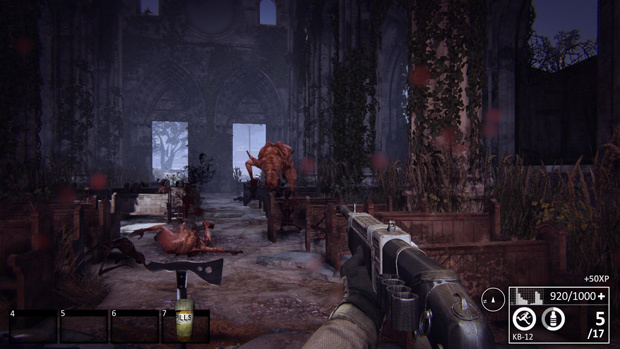 From what I have seen, Nether suffers from a combination of lacking features and unpolished gameplay. Nether has a lot of potential to be a really good game, and I personally am a big fan of the environment. The urban environment’s awesome spooky atmosphere is its saving grace as well as a beacon of hope that better days are still to come. Currently there isn’t that much to explore or do. Even though a lot of buildings are open for exploration, the majority serve no purpose and feel more like an oddly designed empty parking garage than apartment complexes. From what I currently have seen, I must admit that I am a bit disappointed, and that makes me come back to the fact I have already mentioned, the game simply went open to the public too fast. I hope they are able to shape this up into a really fun game, because it definitely has the potential to get far in this industry. We’ll follow up with Nether before long and see how the title has improved as we believe Phosphor Games can recover from this rocky launch with a bit of funding.